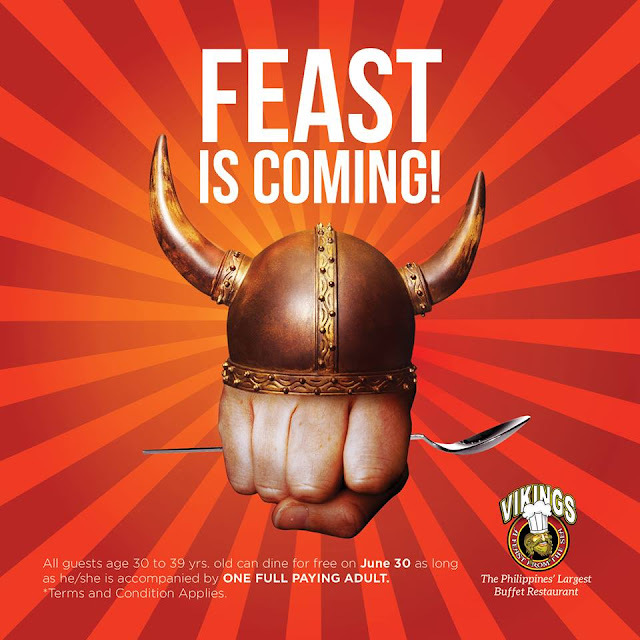 The Food Alphabet and More: Feast is coming at Vikings, Niu by Vikings and Four Seasons Hotpot! 1. All guests’ ages 30 to 39 can avail the Presidential Inauguration promo on June 30, 2016. 2. This is Available to all Vikings Branches, Niu by Vikings and Four Seasons Buffet and Hotpot. 3. Qualified guests can eat for free on the day on both lunch and dinner, as long as accompanied by ONE FULL PAYING ADULT. 4. One full paying adult are adult guests who will be paying full rate without any discounts. 5. Requirements for the qualified guests: the guest must bring an ORIGINAL and VALID government issued picture I.D. with the birthdate imprinted on it, both local and foreign I.D.s are accepted, for proof (such as S.S.S., N.B.I., Driver’s License, Pag-Ibig, P.R.C., Barangay, Unified, Police Clearance I.D. and Passport) In the case that the celebrant doesn’t have a government issued picture I.D., he/she may bring his/her birth certificate supported by any picture I.D. (school I.D., parent’s I.D., company I.D.). 6. This promo can’t be used in conjunction with our current promotions or discounts (including senior citizen discounts). 7. Special Gift certificates to avail this promo will not be honored. 8. Cash Voucher can be used in conjunction with this promo. The Foods are very delicions !